Chelsea Boss Antonio Conte has insisted he wants to keep Michy Batshuayi until the end of the season. Report has it that Chelsea has already lined up a loan move for the Belgian striker should the club complete the signing of Roma Edin Dzeko this week. But Conte insists Chelsea needs all three strikers in other to compete in all three cups they are still in should they sing Edin Dzeko. Conte said: "If you see our squad we don't have three, four or five strikers, we have two - Morata and Batshuayi. "I don't know what happens. But when you play in the Premier League, Champions League and the FA Cup three strikers is the minimum. "We have to see what happens in the market. If we are able to take another player, it doesn't mean Michy has to go on loan." "We have a lot of competitions. Three strikers are the minimum." "I don't know if Michy wants to stay or go on loan - it will be the player's decision, not my decision. I'm ready to continue to work with these players. I'm very happy. But I don't know what happens with the transfer market." 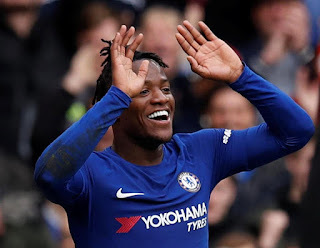 Do you think Michy Batshuayi should remain in Chelsea or fancy a loan move till season's end?